Quoted price is for playing 2 hours over 3 hour stay. Formed in 1991, the Sterling Quartet have studied with the Amadeus, LaSalle, Alberni and Alban Berg Quartets. With a repertoire ranging from Classical and Romantic to Broadway musicals and “light” pop, the Quartet can provide music for anything from a public recital to a private function, such as a wedding or corporate event. The CD enclosed is an example of their classical playing. The Quartet have performed at many prestigious venues including the Wigmore Hall, Royal Festival Hall and Conway Hall in London; the Barber Institute, Birmingham; Cardiff Castle and the Palacio Gaviria, Madrid. They have also played at numerous corporate functions including for Classic FM parties at Lord’s Cricket Ground and the Royal Academy of Arts, at the BT Tower, and at many West End Hotels. They also have wide experience of playing for weddings, birthday parties and other private celebrations. The Sterling Quartet normally play for a total of two hours within a period of three hours, with the exact playing times and programme to be discussed with the client. For example, a popular option for weddings is for the Quartet to play during the marriage service and whilst the guests are being “received”. The Quartet can dress formally or informally to suit the occasion. The Sterling String Quartet do not perform in any outside locations. 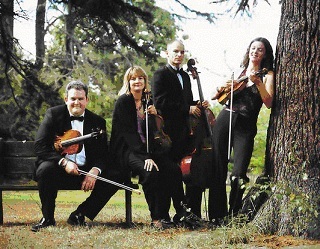 The Sterling String Quartet are based in London. See Pricing for details of travel costs, etc. "Please convey to the string quartet that we were truly delighted with their performance. It was one of the things that made the day truly special and we would recommend them highly." "It was a great pleasure having the Sterling String Quartet and our guests loved their playing. One wrote 'I sat in on them playing before lunch and so enjoyed them I could hardly be civil when people talked to me!' They spoke beautifully to the children and everyone learned something." "… their performance was great …received many compliments from my guests about them."